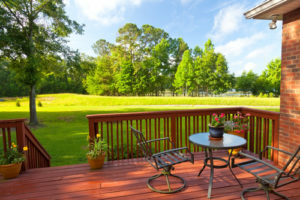 Decks provide a great outlet for those who like to be outside but still have the amenities of home just a few steps away. In order to keep this a possibility, we must perform maintenance on them from time to time. It might be planned out or it could be a sudden need caused from an accident either man-made or from Mother Nature. A little routine maintenance can go a long way in lessening potential headaches from a lack of upkeep while giving your deck the best chance at a long and sturdy life. We’re going to go over a couple relatively easy maintenance situations and how to go through with them so that you can enjoy all your deck has to offer for years to come. Before you apply a new finish, you might have to do a bit of repair work if the boards or railings have become severely weathered, cracked or warped to the point that they are not safe. Take a few measurements and let us know what you need for replacement boards. When it comes to loose railings, it is often as simple as drilling a new hole and using a new bolt to secure it back in place. There are times when that fix does not work and that is typically a sign of more severe damage taking place within the structure. Also, for safety reasons, be sure to check for any nails or screws that may be protruding and use a hammer to pound them back into the wood or replace with shorter screws that still perform their task. When was the last time you gave your deck a new finish? This isn’t just an appearance enhancer; it prolongs the life of the board by sealing it from rain, the harsh rays of the sun, snow, foot traffic and more. This is also the best time to inspect the entire deck, to see what else needs to be repaired. Is there a nail or a screw missing here or there? No better time to replace them than before you apply a new topcoat. This is also an opportunity to change the look of your deck with a different stain. In order to carry out this process correctly, you’ll want to use a proper deck cleaner to remove contaminants and old stain. A stain stripper might have to be used in some areas. After you have thoroughly cleaned the deck, be sure to rinse it off very well and let it completely air dry before applying the new finish. This is one of the easiest and most important things to do to your deck every few years to prolong its life. Doing this basic maintenance every so often can prolong the life of your deck, ensure it’s safe to use and save you money in the long run! If you have any questions about your deck or the steps you should take, feel free to contact us, we’d be happy to help! This entry was posted in Decking, DIY, Lumber and tagged Deck Repair, Decks, DIY, Lumber, Wooden Decks. Bookmark the permalink.